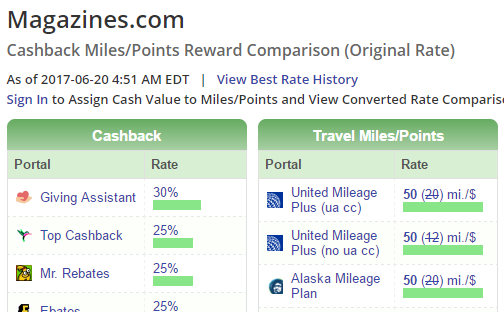 Buy Alaska Miles at 2 cents per point! I am not often an advocate of buying miles, but there are times when it makes sense to buy miles. This promotion may be a good time to at least consider whether its a good time to buy miles. Right now Magazines.com is running a promotion where you can earn 50 miles per dollar when you shop through the Alaska MileagePlan Mall. 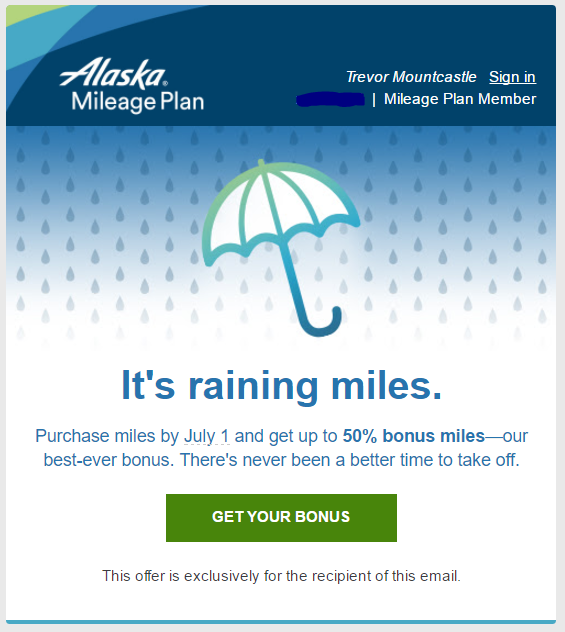 You can also earn United miles through the MileagePlus mall, but, lets be honest, we’d all rather buy Alaska miles given some of the better options on their award chart and partners. There is also a “Tax Recovery Fee” which can get pricey! The cool thing is that if you do buy 60,000 miles, you’ll get 90,000 miles and pay $0.0197 per mile which is inclusive of a $123.75 Tax Recovery Fee! Put a different way, you will pay 1.97 cents per point, a 3 hundredths of a cent savings over buying via Magazines.com. I would never advocate to purchase miles without having a use in mind. In fact, yesterday I just bought Alaska Miles for a very near term use in mind. All that said, sometimes there can be value in taking advantage of promotions. Just remember not to overwhelm your family or friends with magazines. You can, however, make real nice with your doctors and send some appropriate magazines to their offices. As an added bonus, you might have better reading material while you wait! Will you be leveraging either of these opportunities to buy Alaska miles?